The conflict between Japan and the United States during World War II is remembered for its extraordinary brutality, culminating in the (to date) only wartime use of nuclear weapons, on Hiroshima and Nagasaki. Admiral Halsey’s alleged remark exemplifies this brutality. 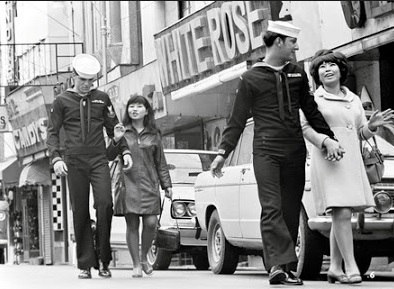 By contrast, the post-war American occupation of Japan and Japan’s subsequent history superficially offer a more benign picture of American-Japanese relations. The U.S. helped rebuild its former enemy and establish democracy, while Japan became an exceptionally prosperous nation, rivaling its one-time conqueror. Beneath the surface, however, the American-supervised reconstruction of Japan had a far more sinister side. A crucial change was legalizing abortion, 70 years ago this summer, leading to the deaths of millions of Japanese children. This alteration, which resulted from war and its consequences, wasn’t a break with wartime violence but a continuation of it. It effectively realized Admiral Halsey’s purported anti-Japanese boast far beyond what he could have imagined. 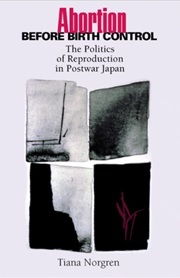 The political scientist Tiana Norgren recounts the evolving status of abortion in Japan in her book Abortion before Birth Control: The Politics of Reproduction in Postwar Japan. Before World War II, abortion was illegal in Japan. Prohibiting abortion was in Japan’s first modern penal code of 1880. Japanese laws and public policies meant to discourage abortion date back even further – in 1667, the shogun, Japan’s military ruler, restricted abortion advertising. Early in the 20th century, certain Japanese groups argued for legal abortion, but made little progress. Doctors were permitted in 1923 to perform abortions to save the mother’s life, but this was about the extent of the change. Concerns for an unborn child’s life played a role in historical Japanese abortion opposition. At times, Japanese officials had condemned abortion, along with infanticide, as murder. Yet nationalism also played a role. A large population was seen as necessary to national strength and imperial conquest. Official government policy in the early 20th century encouraged population growth. During the war, from 1941 to 1945, the number of reported abortions fell, from 18,000 to 1,800. Nevertheless, national ambition predictably proved a less reliable protection for the unborn than concern for human life. Defeat in World War II brought a dramatic change in Japan’s fortunes and the accompanying attitude toward abortion. The war shattered Japan’s economy. Industrial and farm production were devastated, Japan could no longer import resources from its former Asian colonies. Millions were at risk of starvation. American bombing had not only killed roughly 400,000 Japanese but also destroyed a fifth of Japanese housing, leaving millions homeless. Japan’s population increased during the immediate post-war years, both because of high birth rates (which peaked in 1947) and because of all the soldiers and civilians sent back home from former colonies. Japan’s population grew from 72.2 million to 83.2 million in five years. Although American aid prevented starvation, post-war policymakers faced a longer-term problem: how to manage such a large population in a now-impoverished country. The bill passed in July 1948, becoming the Eugenic Protection Law, and opened the door to further expansions of Japanese abortion access. Concerns about Japan’s economy grew. The prime minister declared in May 1949 that partly “to surmount the stringent economic times,” the Japanese must “practice the principles of birth control.” That same month, Taniguchi, invoking the need “to curb the rapidly increasing population,” sponsored an amendment to the Eugenic Protection Law, which allowed abortion if “the continuation of pregnancy or childbirth is likely to seriously harm the mother’s health for physical or economic reasons.” The amendment passed, dramatically increasing abortions. Nevertheless, Americans feared overpopulation as a threat to post-war reconstruction and desired a decreased Japanese birth rate. General Crawford Sams, head of the occupation’s Public Health and Welfare section, may have urged Taniguchi to introduce the Eugenic Protection Law. In January 1949, Dr. Warren Thompson, a demographer advising the occupation, warned, in comments widely reported in the Japanese press, that Japan must curb its population growth to avoid Communism’s rise or the U.S. cutting off aid. Americans might also have contributed to the push for abortion in a very different, more personal way. The presence of 600,000, later 200,000, Allied troops in a beaten, poverty-stricken Japan led to rampant liaisons with Japanese women. Not all these relationships were consensual. An estimated 40 rapes and assaults on Japanese women occurred per day in the second half of 1945 and rose to over 300 per day by early 1946. This increased the likelihood of distressed pregnancies. Most important, American authorities did nothing to stop abortion’s legalization in Japan. Although they criticized the advisory group’s 1946 policy recommendations, authorities allowed the introduction of the 1947 and 1948 bills. By contrast, the Americans vetoed 1948 regulations to discourage contraception. Non-intervention proved less important than population control. Americans might also have been reluctant to stop abortion legalization because they believed, as one internal document said, “As modern contraceptive knowledge is disseminated . . . it is believed that the provisions for abortion will become of little consequence, as they will fall into disuse.” This prediction proved wildly inaccurate. Reported abortions rose steadily, from 264,104 in 1949 to 489,111 in 1950, 805,524 in 1952, and 1,068,066 in 1953. Between 1955 and 1960, 1 million abortions were performed annually — 662 to 716 abortions per 1,000 live births. Official statistics were probably underestimates. Performing abortions was lucrative. Japanese ob-gyns underreported the counts to avoid income taxes. Researchers at a Japanese hospital estimated the actual number in 1953 was between 1.8 and 2.3 million. To put these numbers in perspective, consider: even with low official statistics, a single year of abortions killed more than twice as many Japanese as the American wartime bombing campaign. Two or three years of abortions killed as many Japanese as died in the entire Second World War. Nevertheless, legalizing abortion fulfilled Japanese and American policymakers’ plans to curb population growth. The average number of children born plunged in the years after the Eugenic Protection Law, from 4.54 in 1947 to 2.04 in 1957. This was a greater drop than in the previous 25-odd years (from 5.24 to 4.54) or subsequent 30-odd years (from 2.04 to 1.38). Abortion likely played the primary role in cutting births. Contraception was less readily available in this period and after (in contrast to the ob/gyn lobby’s support for abortion access, advocacy for contraception was far weaker and less organized). Abortion became part of Japanese culture. In the late 1950s, a Housewives’ Federation official said young women would get abortions “like they were going to get a perm” and many women had repeat abortions. Widespread abortion did create a need to cope with the act’s psychological consequences. Centuries-old Buddhist practices of mourning aborted children, known as mizuko (“water child” or “unseen child”), have been a significant part of post-war Japanese society. Samuel Coleman, in Family Planning in Japanese Society, notes that several shrines to Jizo, the guardian of aborted children’s souls, have been constructed in Japan since World War II, three in Tokyo-area temples. 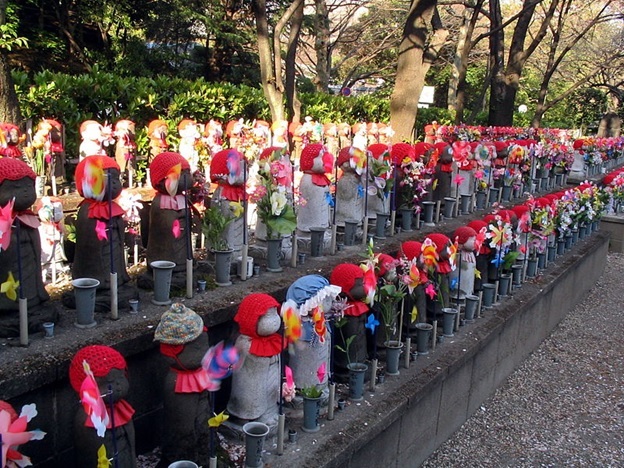 A common practice is for mothers who have had abortions to place small Jizo statues at these shrines, in memory of their children. The Hase Temple in Kamakura began offering such statues to worshippers in 1974; three thousand statues marked the temple grounds by 1976. They dress up the mizuko figurines like little newborns, wrapping them with bibs, hand-knit sweaters, booties or hats against the cold. And they pour water over the childlike figurines to quench their thirst. “I pray for its spirit to safely enter the other world, which it can’t do easily because it died from my own negligence, my mistakes,” said a middle-aged Japanese woman who has been coming for the last 10 years to comfort her mizuko jizo. Viewed 70 years later, the Eugenic Protection Law (revised as the Maternal Protection Law in 1996) appears to have fulfilled post-war policymakers’ intentions all too well. Japan’s birth rate is now so low—fewer than one million Japanese children were born in 2016, in a country of 127 million—that the country’s future is clouded. Japan’s population is projected to fall by one-third in 50 years, when almost 40% will be over 64 years old. The country is now grappling with labor shortages and elder care costs. The growing elder population means more Japanese must fend off neglect and loneliness. Cleaning out apartments of elderly people who died alone is now a professional specialty in Japan. Chieko Ito, a 91-year-old widow whose only daughter pre-deceased her, observed “If this child were here now . . . there would be nothing to worry about.” Of how many other children, who were killed before birth, could that also be said? Japan isn’t unique in having low birth rates and an aging society—many nations face similar conditions. Nor, of course, is Japan the only nation plagued by abortion. Japan is striking, however, for the extent to which low birth rates are the result of abortion becoming legally available. In contrast to many other countries, legalized abortion in Japan was the direct result of war. We can see that the now 70-year-old Eugenic Protection Law, even more than the bombs dropped at Hiroshima and Nagasaki, has proved to be a weapon of mass destruction. ← Would My Grandparents Have Died in the Pogroms? Japan is also one of the few advanced countries which still has the death penalty. Powerful article. I think it should be noted that jizo statues are not just for aborted babies, but also those lost in miscarriages. Blog posts represent the views of the authors and do not necessarily represent organizational views of Consistent Life.